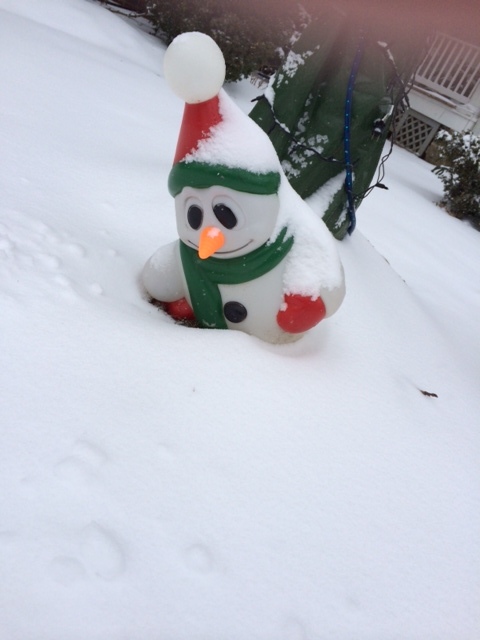 Another snow day in Washington, D.C. and it really is perfect weather for building a snowman but I think I will stick with this little fellow, a jolly plastic snowbaby who is always perky and never, ever melts. 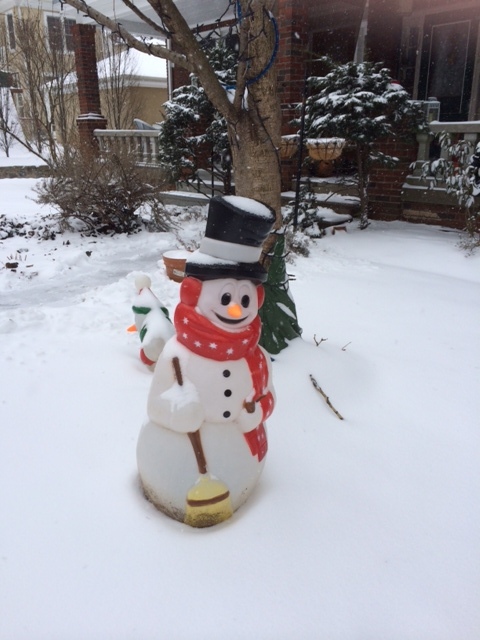 Snowmen are another one of my collecting passions, borne out of the fact that I am part of an interfaith marriage. Christian and Jew–or as my daughter used to say, “You are Christmas, we are Jewish.” Each interfaith couple has their own way of managing the holidays, but for us, it came down to 8 nights of Hannukah, lots of winter decorations featuring snowmen, no tree, and a quiet Christmas day. My husband usually cooks his Jewish vision of Christmas dinner–very Dickensian. If we are in Kansas City with my family we have a much simpler Christmas with ham and velveeta macaroni and cheese, a family favorite called Italian spaghetti (which I can assure you is not Italian at all and is more like a gooey mix between spaghetti and meatballs and macaroni and cheese), lots and lots of dessert and even more presents (10 kids, 17 grandkids–do the math where presents are concerned). We rarely have a White Christmas in D.C., but indoors there are plenty of snowmen to keep us in the holiday spirit. I’ve actually packed all the snowmen away for the season, except for the outdoor fellows, who keep being called for duty by our unpredictable weather. As with any collection, you have to be wary of picking up any old snowman. I like handcrafted fellows and frosted glass or plastic characters. a couple of the frosty snowmen in my collection. My daughter likes the tiny ones–when she was younger, she would build elaborate scenes in the front window, mixing snow people with other tiny creatures. I think she’s lost interest in that, but a few snowmen worked their way into her room this year (and I think may still be there for all I know). One of the best things about snowmen, however, is that you can pretty much make them out of anything–even when there is no snow. 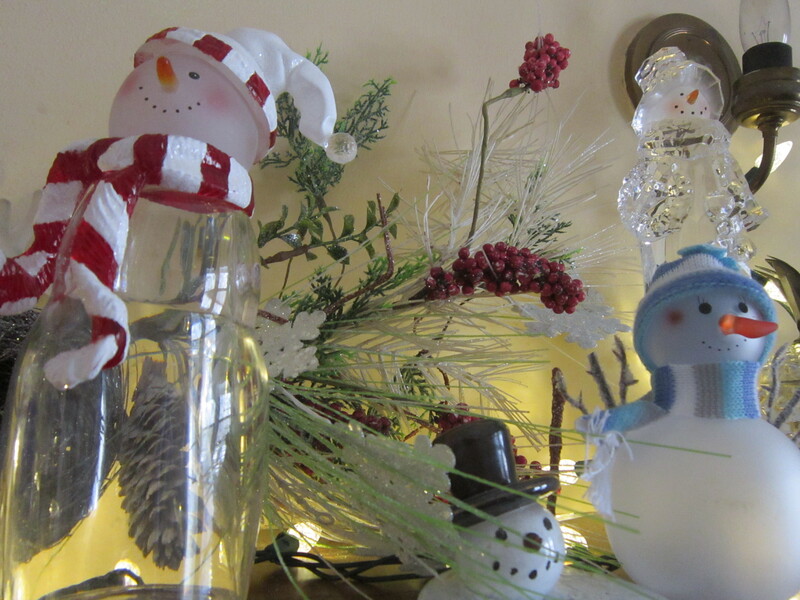 POM bottles are a great shape for making snowmen, as are little Dannon Drinkable Yogurt bottles. Socks, bowling pins, scrap wood, beads–I’ve seen snowmen made out of all of those. A good shape is essential for a snowman, but I think it is really all in the smile–the quirkier the better. My family once had a snowman competition, building creations from whatever we could find in my mom’s craft drawer–snowmen from bottles, cups, and old cloth napkins all emerged and all bore trademark quirky smiles made from sequins, buttons, and beads. Getting back to the outdoors, however, I’m pretty proud of my retro snowpeople–found at a garage sale and purchased with the promise that I would use them happily and lovingly–or no sale!. They have certainly had their share of snowflakes to preside over this year–and I hope for many years to come! 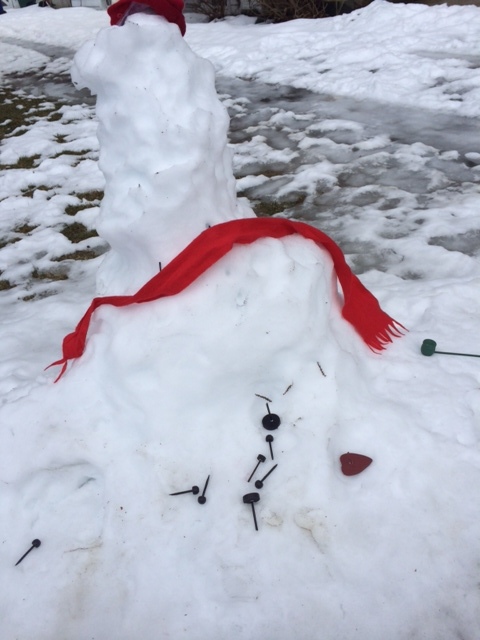 the perils of snowmen made from the real deal–they melt!